Staycations, when the holiday road leads to your own driveway. Sure we’d all love to hop on a plane to Europe or take the family to Wally World but a vacation is not in the budget for everyone. A destination trip for a family of 4 could cost around $4000.00 a week. But having to watch your cash flow is not a reason to deny yourself some good old rest and relaxation. We all need down time and we don’t need to spend thousands of dollars to get it. Enter, the staycation. The stay at home vacation. Where you can spend about $500.00 and still have a great holiday. 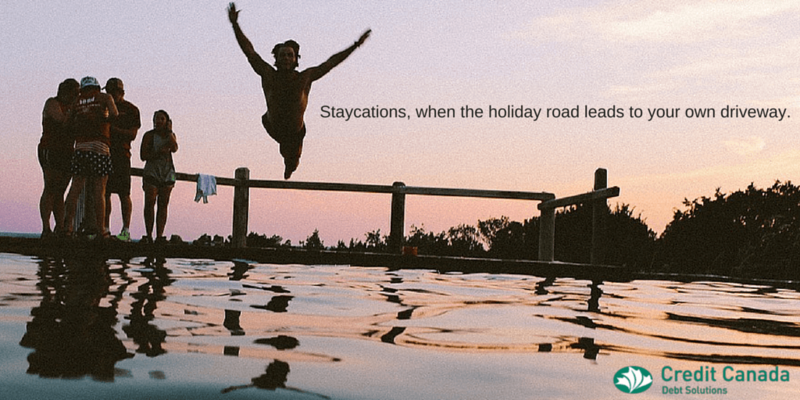 To make your staycation a success, you need to follow only a few simple rules. Stay away from work emails and phone calls, don’t watch TV, and get away from your everyday routine. The trick is to act as if you’re miles away. A little prep work will help too, clean the house first. The last thing you want is to be cleaning during your staycation. Relaxing is so much easier when the housework is done. Do some grocery shopping too, have your fridge ready for being at home. And don’t forget to prep your budget. Have a plan for what you’ll spend on purchased meals and entertainment. With a proper budget you can save up the money before you take the time off so you’ll be prepared and be able to enjoy yourself. Now you’re ready for the fun. Enjoy your back yard. Have friends or neighbours over you haven’t seen in a while. Read that book you’ve been eyeing for months but too busy to pick up. Enjoy the down time and your own home after all, you do work all year to pay for a roof over your head so take some time to reap the benefits. Pretend to be a tourist in your own city. Jump on that double decker bus and get a view of the city while listening to some interesting facts from your tour guide. Have dinner at a restaurant you’ve never been to. Check out some museums or festivals. Just be sure to wear a fanny pack and carry a camera, you don’t want to fit in with the locals. Take day trips or do an overnight stay somewhere. Maybe to a neighbouring city you’ve always wanted to check out. Go Transit offers seasonal service to great tourist spots like Niagara Falls if you want to avoid the stress of driving. Book a night in a bed and breakfast or use a discount booking service like Hotwire to stay in a hotel for a night. Pack a lunch or snacks for the day to help you stay within your budget while on vacation. The staycation lets you sleep in your own bed, avoids travellers remorse and at the end of it all you won’t come home panicking over your empty bank account and feeling like you need a vacation.